The greatest horse race will be the basis of our tipster challenge. We will put up 100,000 KNC as prize for this free to enter competition. All you have to do is guess which 5 horses will give you the best chance to win. Any criteria can be used, form, names, colours anything as this is the most open race to have a idea of the winner. So be prepared for the Grand National on 6th April, 2017. 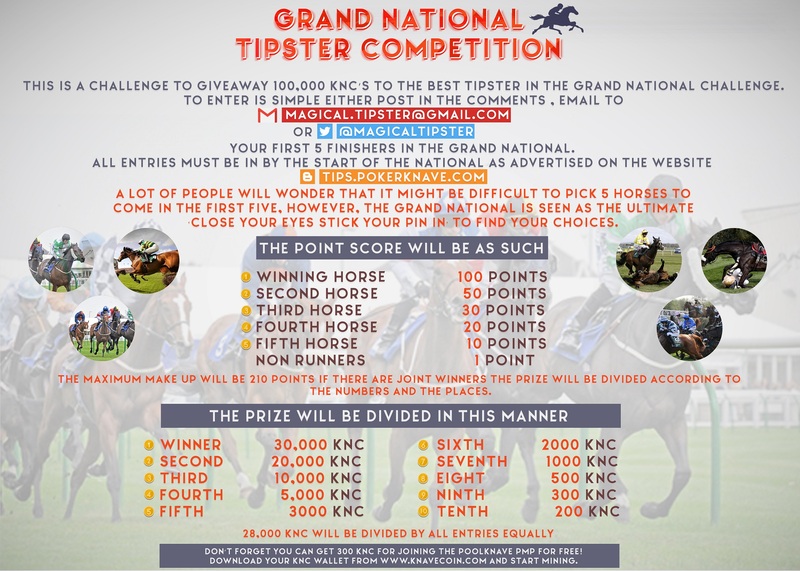 PokerKnave's Blog altcoin, crypto-currency, gambling, Grand National Tipster Challenge 2017, Horse Racing, knavecoin, Latest News, PoolKnave Pari-Mutuel Predictor, The magical tipster. permalink.